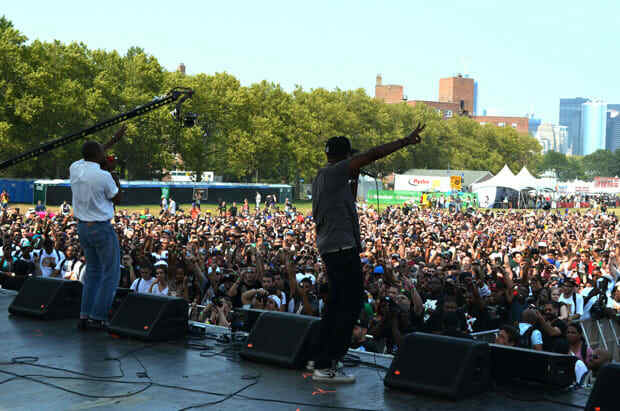 This past Saturday, the annual hip-hop nostalgia-fest Rock The Bells stormed through Governor's Island in New York City to celebrate a bygone era. The all-day rap show featured a hodgepodge of major label and independent acts rocking on four different stages. Headliners included Lauryn Hill, Nas, Raekwon & Ghostface Killah—all performing their respective classic albums, sprinkled with hits from throughout their catalog. The crowd of roughly 17,000 was filled with ‘80s and even ‘90s babies who were maybe in their teens when half of the featured acts peaked. Rock The Bells is more about yearning for the good old days of “real hip-hop” than any sort of relevance to today’s music scene (which might explain why almost no one performing here has had a Top 40 hit nearly a decade, if ever). Still, RTB does hold a soft-spot in the hearts of many hip-hop heads. So even though it was a nightmare scenario of long lines, confusing set times, and the exhaustion that comes with any music festival, we hit the scene to see how it all went down.